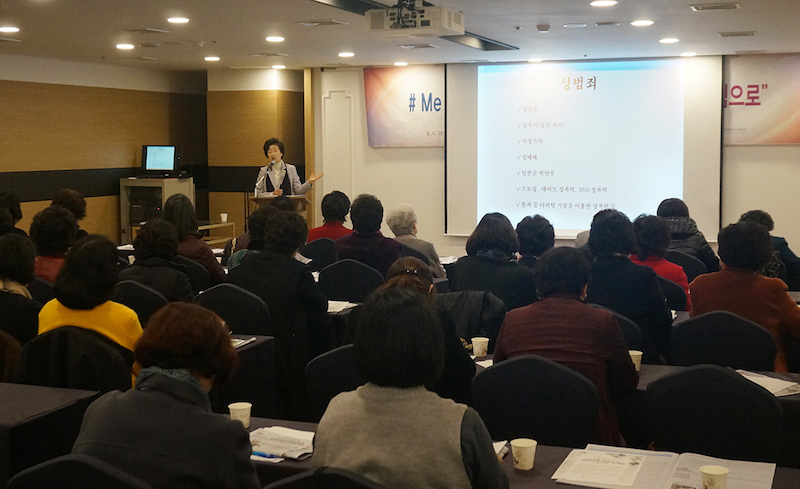 The women’s division of Global Peace Foundation (GPF) Korea brought together more than sixty women leaders from diverse backgrounds for a forum on March 21 in Seoul, under the theme of “Eradicating Sexual Violence With Our Strength." The forum rides on the wave of the Me Too movement, which focuses on the gravity of social problems involving sexual harassment. At the 7th Global Women's Future Forum held at Noblesse Hall in The White Veil, Seocho-gu, Seoul, March 21, participants take a group photo with a campaign board for the eradication of sexual violence. In-Ja Hwang, a representative from the Gender Equality Research Institute and a standing representative of the National Children's Safety Network, described policies that have been implemented to strengthen protective measures for women following a devastating crime in Korea saying, “The term 'female hate crime' came into being after the murder case in the public toilets near Gangnam Station in 2016. At that time, in partnership with various civil society organizations, we campaigned intensively for public toilet safety. This year, the policy on public toilets safety has finally changed.” Hwang encouraged women to report incidents immediately but also acknowledges that, "No bill can completely eradicate social problems, so efforts should be made to prevent the crime and reduce the crime rate." Mihwa Kim, President of GPW Korea, quoted Mother Teresa, saying, “I alone cannot change the world, but I can cast a stone across the waters to create many ripples.” She encouraged citizens to get involved in the discussion and movements to address major social issues like those presented through the Me Too movement. “The world will change when social leaders gathered here stand in the forefront." Leaders attending the forum were inspired to initiate their own campaigns to assist in eradicating sexual violence, and to create a safe and peaceful society for all. One participant reflected that women leaders of today represent the mothers who will raise and educate future generations of men and women in society about peace. Together, they can create the ripple effect that propagates the value of women and their dignity as mothers, wives and daughters to be respected and loved in society. Other leaders present at the forum included Yunsook Lee, Former member of the National Assembly of the Republic of Korea; Gil-yeon Kim, President of the International People to People of Korea; Seom-Sook Lee, Chairman of the Seoul Federation of Korean Women Voters; Geun-hee Kim, vice chairman of the National Unification Council; and Representatives of the National Assembly. Sign up for GPF monthly newsletters to get the latest news on how women are bringing peace to communities around the world.